Spire's HUD with the Magmaul equipped. 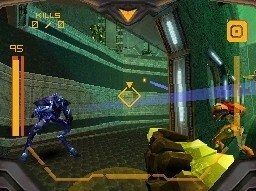 The Magmaul is one of the seven Affinity Weapons of Metroid Prime Hunters, and is the one that Bounty Hunter Spire uses at his arsenal. When fired, the Magmaul produces a grenade of magma and launches it out, detonating three seconds later with very forceful power. Unlike most standard weapons, the Magmaul's projectiles bounce off of walls and obstacles. The weapon can be charged and fired for maximum firepower and a larger blast radius. When used by Spire himself, the blast radius is even more devastating, and it burns the enemy, much like the Plasma Beam or the Light Beam, however in this case, the shooter can be burned by the splash as well. Samus Aran acquires the Magmaul at Alinos after defeating the Fire Spawn. She can open orange doors with the weapon as well as easily defeat ice-based enemies and Noxus. This weapon uses the Universal Ammo. The Magmaul was created by the Diamont, of which Spire is a member. It has been passed down from generation to generation. This page was last edited on 11 August 2015, at 19:01. This page has been accessed 7,284 times.